Most Christians agree that it is important to have daily time with God, but many do not know how to do so. 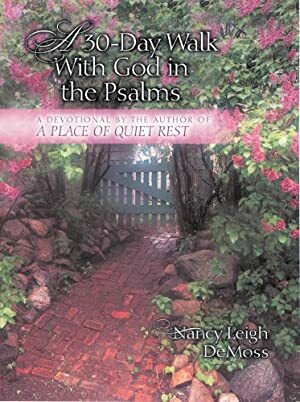 With A Place of Quiet Rest, engaging speaker and author Nancy Leigh DeMoss has taught tens of thousands of women how to attain a rich, consistent daily devotional life. In this companion devotional, she provides a valuable resource to spur readers on in her 30-day challenge to spend time with God. She has mined rich truth from thirty of her favorite Psalms and provided questions and suggestions to help readers develop a lifestyle of praise and worship. Track It. This book has been $8.74 within the past year. This book was $9.19 when we started tracking it. The price of this book has changed 13 times in the past 2,058 days. The current price of this book is $9.99 last checked 4 hours ago. This lowest price this book has been offered at in the past year is $8.74. The lowest price to date was $6.99 last reached on November 11, 2017. The highest price to date was $12.99 last reached on August 12, 2017. We last verified the price of this book about 4 hours ago. At that time, the price was $9.99. This price is subject to change. The price displayed on the Amazon.com website at the time of purchase is the price you will pay for this book. Please confirm the price before making any purchases.